The Xiaomi Redmi Note 3 wasn't the only new device that Xiaomi announced yesterday with the Mi Pad 2 being also unveiled. The long overdue update to the Mi Pad line offers consumers a choice between running Android or Windows 10 if they buy the 64GB version of the Mi Pad 2 which costs just RMB 1299 ($203). The Mi Pad 2 retains the same screen size (7.9inch) and resolution (2,048 x 1,536) of the original Mi Pad but ditches the Nvidia Tegra for an Intel Atom 2.2GHz quadcore processor. The rest of the specs includes an 8MP/5MP main and front camera, 2GB RAM, Wi-Fi 802.11 a/b/g/n/ac, USB Type C, Fast charging and a microSD slot. 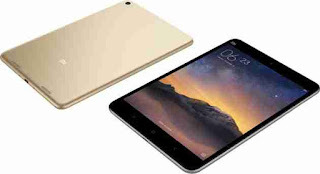 The Xiaomi Mi Pad 2 will be available in a choice of either champagne gold or dark grey. The 16GB version of the Mi Pad 2 will cost RMB 999 ($156), while the 64GB version will cost RMB 1299 ($203).